Ford Models B C K R Y car books include the history of these Ford models, plus brochures and manuals. The Ford Model B was an upscale touring car introduced in 1904. The Ford Model B was also a new Ford automobile produced in model year 1932. It was a much updated version of the Model A. The 'Deuce' is a term used to refer to the 1932 Ford coupe. The Ford Model C was introduced in 1904 and was a version of the first Ford Model A with more modern look and slightly more powerful engine. The Ford Model K was an upscale automobile produced by the Ford Motor Company. It was introduced in 1906 and replaced the earlier Model B. The Ford Model Y (1932-1937) was the first Ford specifically designed for markets outside the USA. 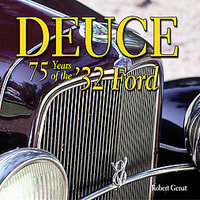 Deuce: 75 Years Of The '32 Ford by Robert Genat (2006). The 1932 Ford, the Deuce, is among the most important automobiles ever produced. A landmark car for Ford, the '32 introduced Henry Ford's groundbreaking V-8 engine, bringing the iconic engine configuration to the masses for the first time. 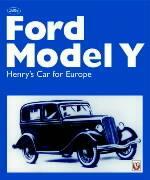 Ford Model Y: Henry's Car For Europe by Sam Roberts (2001). The Model Y was the first Ford designed to sell outside the USA, Ford's first 'world car.' 165,000 examples, plus 30,000 rolling chassis for export, were built in Dagenham between 1932 & 1937, capturing half the British small car market in 1935. 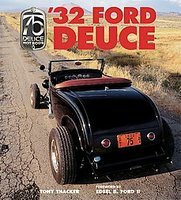 '32 Ford Deuce: The Official 75th Anniversary Edition by Tony Thacker (2007). A complete authoritative and illustrated history published with the Ford Company's co-operation, this book looks at every facet of the Deuce's story: factors leading to its design, how it was manufactured and sold, the development of the now-legendary flathead engine and motorsport exploits around the globe.